Great artists of the Tallgrass prairie continue to join the Tallgrass Art Gallery. Joe Don Brave and Jon Cronin will join the gallery this month. Plan to attend the artists’ reception being held on Saturday evening, Sept. 19th at 7 p.m. This will be an opportunity to view the works of these artists and meet them! “I was born in Kansas City, Missouri in 1965, and named Vincent Paul Brave, after two famous artists, Vincent Van Gogh and Paul Gogan by my father, Franklin Brave, a successful professional artist and graphic designer. Two weeks after I was born, my dad decided to nickname me Joe Don after the Oklahoma football legend Joe Don Looney, the name stuck and I have been Joe Don Brave ever since. “I moved to Oklahoma when I was nine and lived in Osage County with my Osage people until I left for college. I was raised in the tradition and customs of the Osages, and am still an active participant of our annual traditional ceremonial dances. “My father was an accomplished artist, and though he passed away when I was eleven, I spent my childhood, being influenced by his skills and artwork. I still remember visiting him as a child, in his studio and being given markers and paper to create with alongside him. “I studied art at the Institute of American Indian Arts in Santa Fe, New Mexico, where I learned the fundamentals of art and museum studies. “I began a career as a Museum Technician at my tribal museum, the oldest tribal museum in the country, in Pawhuska, Oklahoma. My career continued at the National Museum of the American Indian; Smithsonian Institute in New York City. During my 10+ years in New York City, I worked with other organizations such as Sotheby’s Auction House as an art handler, the Tibetan Museum of Art on Staten Island as Collections manager and the Native American Community House Art Gallery, as a Gallery Technician. “Besides my professional museum career and my artwork, I have had the opportunity to work on a fishing boat off the coast of Monterey Bay, California, bar tending in New Mexico and landscaper in Colorado. After twenty years of working around the United States, I decided to return to Osage County and pursue my artwork full time. 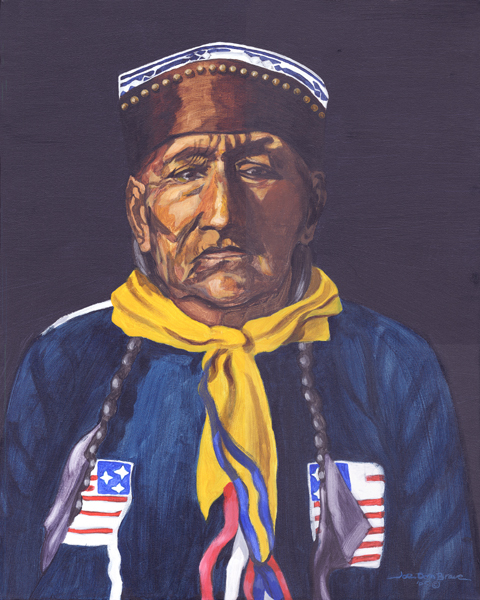 “His training in Santa Fe and the influence of his father is obvious in his outstanding pieces of art,” said gallery owner Bruce Carter. Brave, who is Osage and Cherokee, works at the Osage Tribal Museum and resides in Pawhuska, Oklahoma. Brave’s paintings and prints will be available for purchase at the Tallgrass Art Gallery. 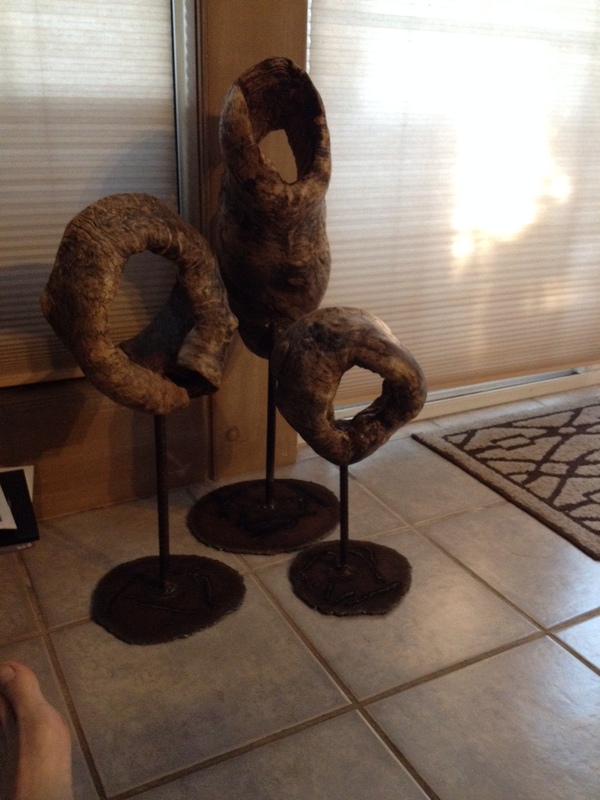 Also joining the gallery is Jon Cronin, of Dodge City Kansas who will be showing his sculptures using objects found in nature. His pieces often feature pieces of trees found, then worked to reveal their natural beauty. “I was blessed to be born into a simple rural home and have mentors like my grandfather and father who taught me to see the beauty and wonder in the natural things that surround us. Things that are often taken for granted and overlooked. Later in life I was influenced by an art professor who stressed that the best designs come from nature.